You never forget these kinds of itinerant street performers once you’ve seen them live. 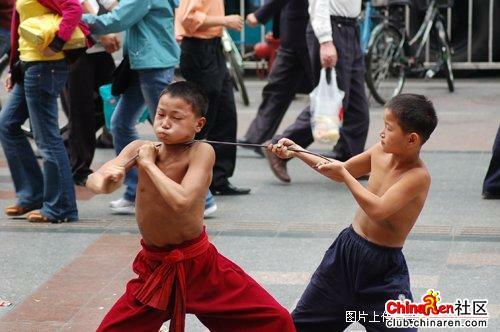 They present a mix of acrobatics, feats of endurance and strength, and qigong body control that allows them to do things like swallow a sword, or force a live snake through the mouth and out the nose. Such performances, related to martial arts, have been going on in China for a long, long time (apparently sword swallowing showed up from India in about 750 A.D.). I used to see a lot of this when I was little. I don’t understand why there are still so many of them. When they grow up I’ll hire them as my bodyguards. We should not be giving them money, but asking the government to help them. Your photos are pretty good. But you don’t understand the situation. There’s definitely someone behind them who’s in control. Why aren’t they in school? Why don’t the police pick them up? I would rather take personal responsibility first, anything else is moral cowardice. it’s not always that simple. One of those comments mentions that they are probably under the control of a “supervisor”, and if you give them money, you merely encourage the overlords to work them even more. This way, the kids are no better off. I remember hearing from friends who went to asia that in some places there’d be mobs of children selling flowers, but the tourist guides would encourage you NOT to buy them. Alternate explanation of child street performers as explained by my H.K. national friend. This does not apply to these particular photos, or individual situations. But, here’s a little history concerning the origin of this kind of street performance. Maus, that’s interesting. Some of the comments did praise the kids for their skills, and thought perhaps with more training they might become professional acrobats…or assassins. Previous post concert content in virtual China? Next post Netease News: Satirical!